The Best Place to Hunt Meteorites: Hundreds Found Every Year! Meteorites from Antarctica: Incredible numbers of nearly perfect meteorites are being found in the "blue ice" ablation areas of Antarctica. 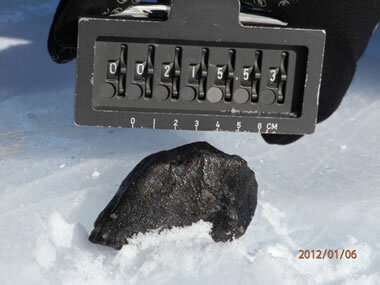 The photo above shows several specimens collected from the Miller Range icefield by NASA's Antarctic Search for Meteorites. Image by NASA. Meteorite find: When meteorite hunters find a specimen in the field, it is photographed on-site with a measurement scale and an identification number visible in the background. NASA image. In most parts of the world, a person could search throughout a lifetime and never find a single meteorite. However, a small number of researchers are finding several hundred meteorites each winter in a few special locations in Antarctica. Meteorite map: A map of meteorite recovery locations in the Transantarctic Mountains. NASA image. In Antarctica, freshly fallen meteorites are protected by the cold climate. Iron meteorites do not rust in the cold conditions, and stony meteorites weather very slowly. 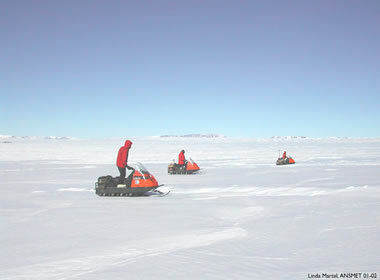 Members of the search team move across the ice on foot or by snowmobile looking for meteorites. The dark-colored meteorites contrast sharply with the white snow and ice. Some of the dark objects found are meteorites, but the searchers do find many terrestrial rocks that have been incorporated into the ice by the glaciers. They search by walking or by snowmobile, and which method they use is determined by ice conditions, weather conditions, and the abundance of meteorites present in the area. Although the cold climate is ideal for preserving meteorites, it presents a huge challenge to the researchers who hunt them. They have to travel to a remote location where they will live in tents in subzero weather. Out on the hunt they face intense cold, fierce wind, and blistering sun. It takes a determined and dedicated person to do this for several weeks each year. How Antarctic ice transports meteorites: A model of how meteorites fall in a zone of accumulation, are deeply buried by snow, and then flow with the ice to a zone of ablation where they reappear at the surface. NASA image. The two most important reasons why meteorite hunting in some parts of Antarctica is so productive are: 1) ice movements, and, 2) ablation. The ice of the Antarctic continent is in motion. The ice grows thicker in some areas from snow accumulation, then it slowly flows away from those areas under its own weight. Remember that the continent is covered by a glacier. The theory of ice movement is shown in the accompanying diagram. It shows how meteorites are buried in zones of snow accumulation. Then the ice moves under its own weight away from these snowfields towards the edge of the Antarctic continent. In some areas rock formations block the flow of ice. Where this occurs, steady katabatic winds can remove the ice by sublimation and mechanical abrasion. Up to ten centimeters of ice per year can be removed by these ablation processes. 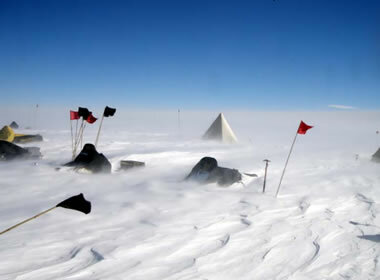 Meteorite hunting weather: This photograph shows what conditions can be like for meteorite hunters in Antarctica. It is a very difficult place to live, even for a few weeks. NASA image. The meteorites found in Antarctica are in pristine condition. They are not weathered like meteorites found in temperate climates. The original fusion crust, formed by ablation of the meteorite as it fell through the atmosphere, is often preserved. When a meteorite is found, a snowmobile with a high-resolution GPS receiver is driven to the site to obtain a very accurate location. The meteorite is then photographed in place, recovered, placed into a sterile Teflon bag, assigned a unique field number, logged into a field book, and given a detailed field description. The discovery site is then marked with a flag bearing the meteorite's identification number. Meteorite hunters on snowmobiles: Meteorite hunters slowly traverse the ice in a systematic pattern while searching for meteorites. NASA image. Almost all of the meteorites found on Earth are believed to be pieces of asteroids. Some researchers believe that five to six percent are pieces of the asteroid Vesta. They are pieces of Vesta that were dislodged by impacts with other asteroids. A very small number of meteorites (less than two hundred) have been determined to be pieces of Moon or Mars after careful study. They arrived on Earth after being dislodged by asteroid impacts, travelling through space for millennia, then falling to Earth. A few of these rare meteorites have been recovered from Antarctica. The lunar meteorites are rocks such as anorthositic breccia, basaltic breccia, gabbro, and mare basalt. An orthopyroxenite rock from Mars has also been found. ANSMET, The Antarctic Search for Meteorites: Webpage for the ANSMET Program on the Case Western Reserve University website. Antarctic Meteorite Collection: Information about the US Antarctic Meteorite Program on the NASA website. 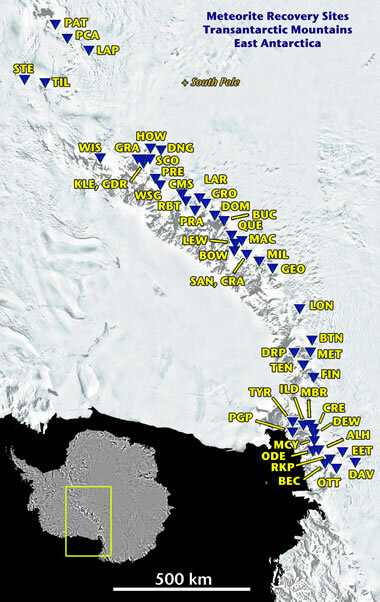 Antarctic Meteorite Recovery Locations: Map showing the location of meteorite recovery sites in the Transantarctic Mountains of East Antarctica, posted on the NASA website, last accessed January 2017. Antarctic Meteorite Newsletter: An index to copies of the Newsletter from August 1994 through present. The newsletter contains classification information, petrographic descriptions, photographs and other information about meteorites recovered during each field season. The meteorites found during these expeditions become government property and are shipped, still frozen, to be thawed under clean room conditions at the Antarctic Meteorite Curation Labs at NASA's Johnson Space Center. Photographs and data obtained from the meteorite collection are made available to researchers and the general public through the Antarctic Meteorite Newsletter. Check out a few issues if you are interested in meteorites.